Seward Highway: O'Malley Rd. to Dimond Blvd. Welcome to the website for the Seward Highway: O'Malley Road to Dimond Boulevard project. The Alaska Department of Transportation and Public Facilities (DOT&PF) will use this site to keep you informed about project development. Please refer to this site for updates on the project, documents, announcements of public meetings, and to make a comment or suggestion. This is the third in a series of projects to improve capacity, safety, access, and connectivity on the Seward Highway between Rabbit Creek Road and 36th Avenue. For more information on the project history and background, click here. Expansion of the Seward highway from two to three through lanes in each direction. Diverging Diamond Interchanges at O’Malley Road and Dimond Boulevard. A grade-separated undercrossing at Scooter Avenue/Academy Drive. Improved and new pedestrian and bicycle facilities. Improve safety throughout the project corridor. 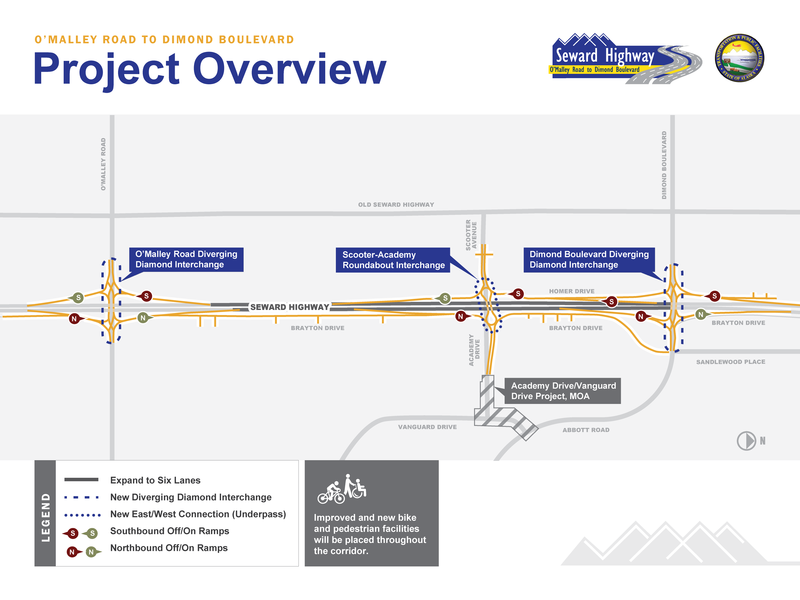 Improve connections between both sides of the highway and improve access to the Dimond Center retail district for both pedestrians and vehicles. Add new bike and pedestrian routes and enhance existing connections throughout the project corridor. Increase capacity at the O’Malley Road and Dimond Boulevard interchanges. This project will include public and stakeholder involvement and coordination with adjacent projects such as the Academy/Vanguard Drive Traffic Circulation Improvements (Municipality of Anchorage [MOA] project).